MARIA HART explores Bermuda, a 21 square mile subtropical island getaway with luxury at its core. For such a small island, Bermuda is blessed with a bounty of natural beauty: Sunshine, pink beaches, native cedar trees, underground caves, tropical flora, and turquoise seas that twinkle like diamonds inside the Great Sound bay. A bit Caribbean and a bit British, Bermuda has a character all its own and a spa experience to the island should reflect that. Fortunately, it’s a pirate’s chest full of spa treasures so there is no need to settle for the ordinary. Here I’ve selected five of the most distinctive spa experiences on offer that also sparkle with unique Bermudian character. There is certainly something for everyone to make any encounter as unique as the island itself. The entire package takes place in your own private suite with a shower, washroom, changing space and private balcony surrounding the treatment area. Dark wood and stone features in the decor, and the smooth stones used in the welcoming foot ritual seem to merge the experience with its surroundings. After pampering your feet, a sugar soft citrus body scrub gently exfoliates the entire body. Then comes the fruit bath to literally immerse you. Alluding to some of the Swizzle ingredients, a giant granite oval bath floats with orange, lemon, and pineapple slices. It is here I sipped my fruity Rum Swizzle while gazing out at the glorious blue sea, white roofs, and palm trees. A full body and scalp massage with essential oils follows the bath and my holistic-minded and caring therapist worked my tension into submission. This is certainly the sweet, suite life. Brand new this year from La Serena Spa at The Reefs Resort and Club is the BIOTEC facial. This combination of Elemis products and technology is designed to energize the skin for a boost to your skin care routine. Think seaweed and galvanic current combinations. There are six types of facials available targeting different needs, and my therapist helped me to choose the one for me which left my skin dewy. A great addition to the regular full range of spa service is their medical massage and laser treatments, which help speed healing of injuries. From the lounge chairs in the relaxation area, gorgeous views of white Longtail birds in flight over the multi-blue sea are a treat to watch. Colours of turquoise, royal blue, teal and navy swirl around the reefs, among which SUP boards, snorkelers, and kayakers explore. The spa reflects the colours seen through the windows and a bonus to this spa is the option to put yourself in the scene for an additional $50 USD. This provides access to the resorts’ private beach and non-motorized water sports. Timing: allow 30 minutes pre and post to relax and refresh. If using the beach facilities, go beforehand to avoid washing off the products. Though the sub-tropical sunshine draws many people to Bermuda, sometimes a body needs to retreat from the sun to care for the skin. 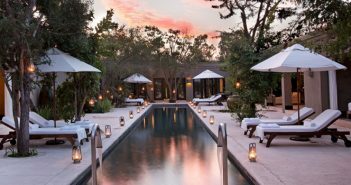 The Sense Spa at The Rosewood Hotel at Tuckers Point is both a physical and sensual retreat to an exclusive part of the island. Expanses of land which include the Tuckers Point Golf Course open up as you approach the resort. Your sophisticated spa experience here begins the moment you check in as the welcoming reception staff makes you feel almost like you are visiting the home of a close friend rather than a commercial establishment. Refreshing Hibiscus tea and lemon water as well as fresh and dried fruit are on offer in the pre-treatment area. Their wide range of treatments highlight natural Bermuda remedies, some of which are grown in the adjoining garden. On an island with strong summer sun, this spa takes care of its sunburned clientele with an ice and aloe treatment. My accommodating therapist hand cut the Aloe Vera plant from the garden and soothed my over indulged skin. The Sense Spa seems a quintessential tribute to a genteel era where hospitality, tradition and comfortable surroundings reign. Wicker furnishings and marble floors flow throughout, and a bright relaxation room exudes a tasteful Bermudian home feeling. Here, enjoy a cup of hot tea following your treatment without feeling rushed. Afterward, I relaxed by the gurgling, palm tree and frilly umbrella-lined reflecting pool…in the shade. Timing: Arrive 30 minutes prior to treatment and allow an hour post to relax and refresh in the fully stocked shower and change area. Get even closer to the natural world by going underground. 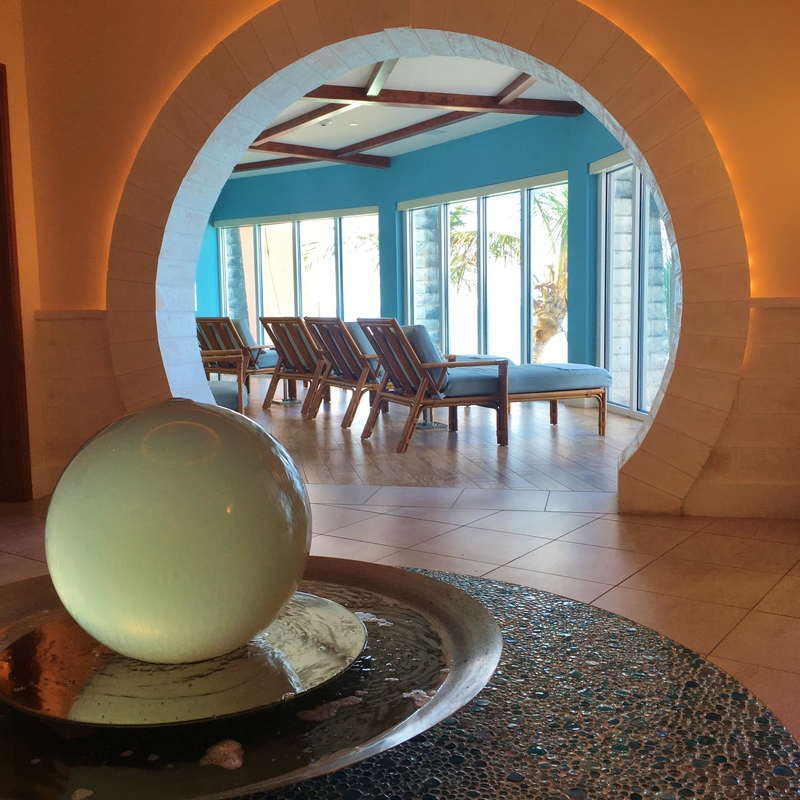 A deeply healing massage awaits at the subterranean Natura Cave Spa at Grotto Bay Beach Resort. From an outdoor waiting area you are escorted downward into a space designed by nature. Imagine a geode rock. As a geode initially appears ordinary until you see inside, so it is here: A turquoise tinged, stalactite draped gem, natural and unadulterated. It feels like entering a dimly lit, cool cocoon of silence, sheltered from the bombardment of heat or cold, noise or wind or glaring light, where your senses are freed to focus on the touch of the therapist. Private canvas tents float on crystal clear pools of water making it feel as though the entire cavern is exclusively yours. Listen to drops of water which grow at the tip of the stalactites and then plop into the water, leaving just a quiet ripple to attest to the profoundly calming event. Using organic products, a Deep Tissue massage by a highly skilled therapist was among the best I’ve had. She seemed to instinctively know how much pressure to put on an injured area to ensure it too, received much needed attention. Moreover, this is a natural and eco-conscious experience without sacrificing a luxurious feel. Timing: Arrive no more than 10 minutes prior to treatment. You can freshen up briefly afterwards in the restrooms near the resorts outdoor restaurant. Tip: wear flat, non-slippery shoes. Finally if a full day to yourself is what you need, this is the place to go. The Willow Stream Spa enjoys one of the most spacious island locations in the hilltop Fairmont Southampton Hotel. Set on almost 100 acres with some of the most panoramic scenes on the island, the hotel and spa ooze luxury. This spa has found favour with locals as well as hotel guests for its pampering as well as its extensive facilities including fitness room, indoor-outdoor pool and jacuzzi’s, sauna and steam room, and fully stocked showers. There are plush indoor lounges with fresh fruit and granola snacks for men, women and couples, and an outdoor terrace boasting dramatic sea views. Lunch can also be enjoyed in this setting. It was here I was among the first guests to indulge in the freshly launched ‘True Bermuda Signature Expression.’ This is an extravagantly fragranced journey conceived from the desire to bring an authentic Bermudian experience to hotel guests. It starts scrumptiously with the taste of local Rum cake and tea. Then the surrounding salty Atlantic Ocean is drawn on. Pink tinged to reflect the beach sands, rough Sea Salt is used to exfoliate the skin. Next, visualize the stunning Royal Poinciana tree covered in its flamboyant red-orange flowers while you soak in a bath fragranced with this lavish aroma. Timing: Allow as much time as you like. I was assured I could even leave and return up until 9 pm.